Has your home in Garland Texas fallen victim to a water leak? Are you searching around the web for a company that can locate, diagnose and potentially repair it? If so, you’ve come to the right place! Here at Flow Plumbing we’re the go to experts for leak detection in Garland TX! 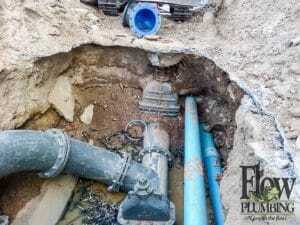 We not only locate all water and sewer line leaks, we repair them too. With over 25 years experience in the plumbing industry it’s safe to say we’ve seen 1000’s of unique plumbing leaks over the years. So you can rest assured that no matter how large or small your leak is, we can provide you with resolution quickly and affordably! Here at Flow Plumbing we use a unique blend of highly skilled plumbing personnel and cutting edge technology to locate even the most hidden leaks in water lines. The same can be said for our sewer line leak detection methods. So whether your home has fallen victim to a clean water leak, the most common type of leak we locate, or a sewer line or “dirty water” leak, we will find it! We perform all of our leak detection in Garland, Mesquite, Sunnyvale, Forney, and the surrounding cities with the pinpoint precision and accuracy necessary to ensure quick leak detection, and effective repair. Do not hesitate to pick up the phone and give us a call to ask questions or schedule our water leak detection service. We’re standing by ready to in Garland Texas today! We can even locate water leaks in commercial buildings and apartment complexes! Need Fast & Affordable Leak Detection in Mesquite? months on end. One of they key indicators that you might have a slab leak is an increase in water bill month over month with no visible signs of water damage anywhere in the home. If you have noticed a sudden increase in your water bill and fear you may have a leak give us a call today to perform a fast & affordable slab leak detection in Garland. How do I know if I have a plumbing leak? Due to the fact that plumbing systems are contained within walls or run underneath flooring, leaks can occur and go unnoticed very easily. Below is a list of some of the most common signs that will indicate a leak in your home. If you notice any of the above symptoms either by itself or coupled together with others it is extremely important that you contact a licensed plumber to come out to your home or business immediately. Our water leak detection service in Garland is amongst the most accurate and affordable around, give us a call today at 214-388-8838. We’re standing by ready to help! How much will it cost & how long will it take to find my leak? Looking back over the years, it wasn’t all that long ago that leak detection in Garland TX would have been an all day affair. Thanks to the latest advances in plumbing technology, and our highly skilled water leak detection technicians, most plumbing leaks can now be found in under 2 hours from the time we arrive at your home or business. Flow Plumbing’s investment in equipment and constant plumber training has made our leak detection service amongst the most affordable and accurate in the Dallas Forth-Worth area! When you call us our to your home you can rest assured that an affordable, dependable and experienced leak detection company will be handling your needs. Give us a call today to schedule fast & affordable water leak detection in Garland. How does Flow Plumbing locate a slab leak? You may be asking yourself, how does Flow Plumbing actually locate and detect a slab leak? It all starts with our exceptionally trained and experienced plumbers. They are the ones who perform our slab leak detection in Garland Texas. From the time they are dispatched until the job is complete they put 100% focus and effort into resolving your plumbing issue. Did you know there are a few tests you can perform to determine if a pipe under your homes slab is leaking? -First you’ll need to view a blueprint or plumbing layout of the pipes that run underneath your homes slab foundation. Next, you’ll simply put your ear to the floor and listen for water swishing through your pipes. -You can also performa heat or hot spot test. Using your hands and feet (shoes off!) you will walk and feel around your homes flooring for spots that are either unusually warm or cold. If a hot water supply pipe is leaking, the heat from the water will cause the flooring to heat up as well. This is also known as a “hot spot” method for detecting slab leaks. The exact opposite is true if the leak is in a cold water supply line. -Turn off the water main to your home. The water meter should stop spinning as soon as the water supply to your home is turned off. If it continues to spin it is a sure sign that water is flowing through a leaking pipe or plumbing fixture. If your home has a leak contact us today to schedule your leak detection in Garland immediately. Once one of our licensed technicians arrives at your home to provide you with a slab leak detection, a determination will be made as to whether or not a leak is present. Once we have confirmed that you do indeed have a leak, we will provide you with a written estimate to repair it. Once this is done and you agree to the Guaranteed Price Estimate we will begin working immediately! We will also provide you with options such as breaking through the slab or rerouting piping to ensure we find the right solution for your home and budget.